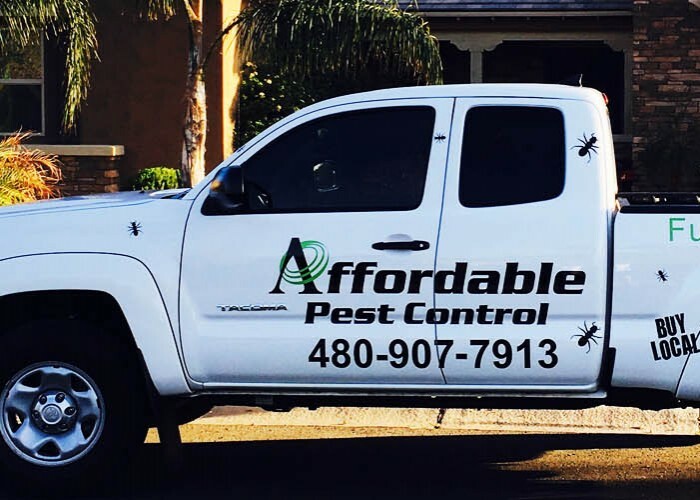 Since our beginning, Affordable Pest Control has been dedicated to just that: cost-effective, pest management services throughout the east valley and surrounding communities. Our team is committed to the highest level of customer satisfaction, and is proud to provide products and services that are safe for you, your family, home, and business. Our goal is to provide each of our customers with services they can count on month after month to keep their homes and businesses pest-free and clean. We provide a comprehensive range of services from scorpion control, ant control, bed bug treatments, cockroach extermination, black widow control, and gopher exclusion. For more information about our pest management services, please check out the testimonials below, or contact us at 480-907-7913 today. We offer free estimates for all of our work. I have been with Affordable for over a year and I love them. Very reasonable rates and the staff have always been super nice. They have worked with me on several occasions that made my life so much easier. I can't thank them enough for their service. We moved into Encanterra 4 1/2 years ago. We've been with APC ever since and they're great. Highly recommend them. Affordable Pest Control handles treating our dog boarding facility. It's a very large area and they work with us very well to set up an appropriate schedule. Highly recommended, very efficient, and prompt. Can't ask for much more. Thank you for getting our pest control needs handled in such rapid fashion. Much appreciated! The young man that serviced our home was clean cut, courteous and professional. We could not have asked for any better service. Special thanks to Mike and his service tech George. Their knowledge and attention to detail is 2nd to none. Not only that, they treat you like family. Thanks affordable pest! THANK YOU Affordable Pest.....always there when you need them. When we recently had a couple of scorpions in our home, they responded the next day with additional spray both inside and out. Although, we spray monthly, we don't think all our bordering neighbors do, which can be an issue. If you need a great pest control company. This is the one to call! I highly recommend Affordable Pest Control for any of your insect problems. The tech, Jim, was very punctual, thorough, and nice. Thank you for doing such a great job. We were referred to Affordable Pest Service by a friend and were extremely pleased with the product quality and customer service received. We definitely plan to buy from Affordable Pest Service in the near future! We have been extremely happy with Affordable Pest Services since switching companies last year. Affordable Pest is less expensive but uses the highest quality and most effective treatments so they only have to come to spray every other month. We appreciate that Mike took the time to get to know us and understood our family’s needs. Great service. Great price. Local family owned company. Great to do business with. We highly recommend Affordable Pest to all our family and friends.